In 1983, Wayne Porter began to focus less on sheep, and more on sculptures. The result is South Dakota's Porter Sculpture Park. 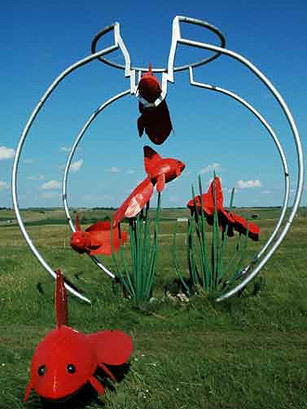 Located 25 minutes west of Sioux Falls in the town of Montrose, Porter Sculpture Park features over 40 larger-than-life, recycled metal structures  from swimming goldfish to the hovering vultures perched at the 10-acre park's entrance. Porter reportedly sold his sheep to pay for the most famed structure on the property  a 25-ton, 60-foot tall longhorn bull that rivals the size of one of the Mount Rushmore heads. The park welcomes visitors, who Porter once described as "a little bit bent," in the summer season (from Memorial Day to Labor Day) and offers tours with the man himself.